The e-Drive project draws on the expertise of world class research institutions and industrial organisations at the forefront of technology development. Details of each partner can be found below. The University of Edinburgh is one of the largest and most successful universities in the UK with an international reputation as a centre of academic excellence. It is home to over 30,000 students and attracts students and staff from 140 countries. The University of Edinburgh is regarded as one of the world’s top universities, consistently ranked in the world top 50 and placed 21st in the 2015/16 QS World University Rankings. 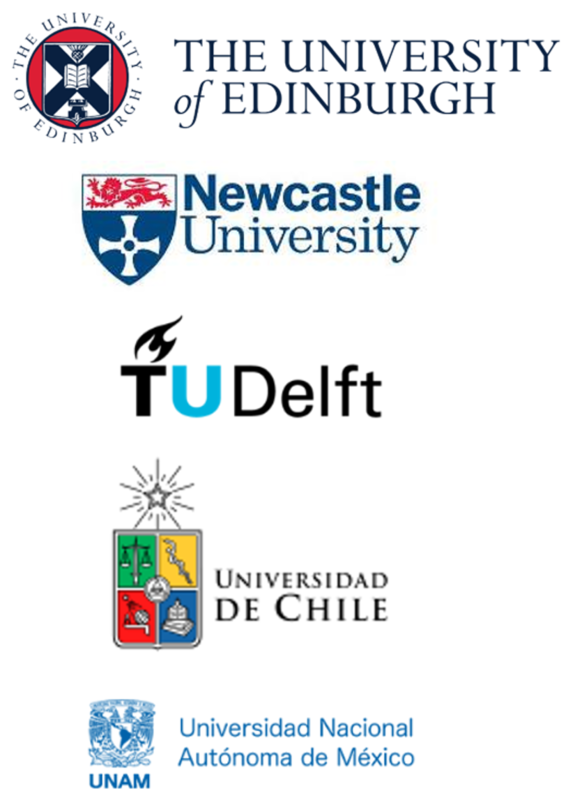 Newcastle University is a member of the Russell Group, comprising the UK’s leading research-intensive universities. It has one of the largest European Union research portfolios in the UK and has research links with many other countries. Its research spans a wide range of activity with a strategy to address major societal challenges. Over 23,500 students from more than 100 different countries choose to study at Newcastle. The University of Chile is the oldest higher education institution in Chile. Generating, developing, integrating and communicating knowledge in all the areas of knowledge and culture are the mission and basis of the activities of the University. This makes up the involvedness of their work and directs the education they impart. UNAM is the largest university in Latin America. As a public research university in Mexico City, UNAM is widely regarded by many university world rankings as the leading university of the Spanish-speaking world. UNAM has excelled in many areas of research. The university houses many of Mexico's premiere research institutions. In recent years, it has attracted students and hired professional scientists from all over the world, creating a unique and diverse scientific community. Albatern's WaveNET technology is a radical new solution to the problem of economically viable wave energy harvesting. In contrast to the majority of existing approaches, WaveNET is designed to exploit the interactions between absorbers within a coupled, modular and scaleable three-dimensional structure that offers a step change technology with more efficient operation at lower cost. The company continues to develop key expertise in the analysis and design of large articulated offshore structures, hydraulic networks and MVDC electrical collection and distribution grids as well as pioneering new mooring system designs and marine operations techniques. 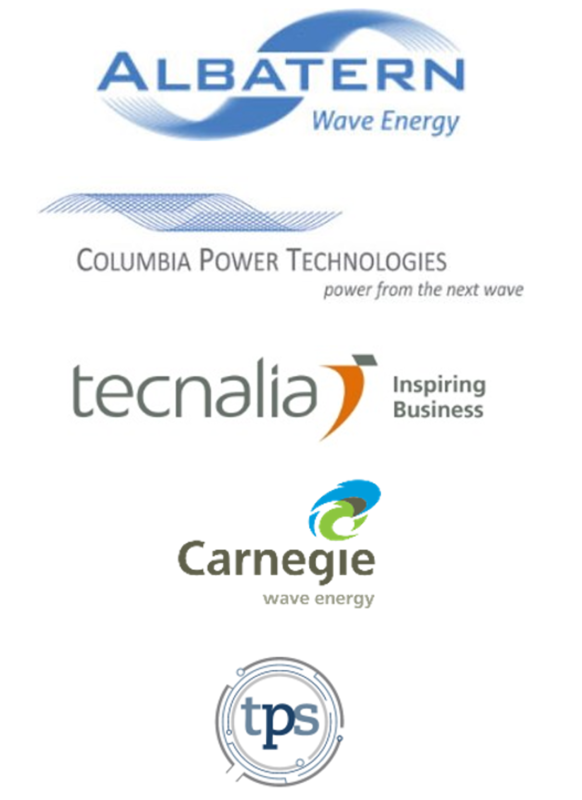 Columbia Power is the worldwide leader in direct-drive wave energy systems. Their patented system is scalable. It can be sized and deployed in a wide range of applications from powering oceanographic sensors to generating megawatt-scale electricity. They are commercializing a next-generation solution that will deliver the qualities that their customers need to develop profitable wave energy projects: survivability, a competitive cost of energy and a low environmental and stakeholder impact. Tecnalia anticipate's future challenges to view, identify and implement technological, imaginative and creative solutions providing added value and producing real results. With a global presence, they transform knowledge into GDP to improve people´s quality of life by generating business opportunities for companies. Carnegie Wave Energy Limited is the ASX-listed inventor, owner and developer of the patented CETO wave energy technology that converts ocean swell into zero-emission renewable power and desalinated freshwater. Over $100m has been invested to fund the development of the CETO technology. Carnegie employs a combination of rapid prototyping, computational simulation, wave tank testing and, in-ocean testing in developing CETO. Turbo Power Systems (TPS) design and manufacture world class power conversion systems using cutting edge technology. Listed on the London AIM stock exchange, they continually strive to deliver market leading solutions that exceed their customers’ expectations. They have experience working in a range of sectors with a wide array of clients.